Anne Bronte is often an afterthought in books & articles about the Bronte family. The youngest, quietest & most reticent of the siblings, Anne was also, I think, the most resilient. She hated to be away from Haworth as much as Emily & Charlotte, but she held down a job with the Robinson family for nearly five years. She faced her early death from tuberculosis with courage. 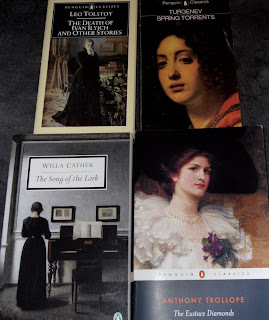 Most importantly from the viewpoint of literary history, she wrote The Tenant of Wildfell Hall, a novel of great power. Our view of the Brontes is very often Charlotte’s view. Charlotte lived the longest, was famous in her lifetime & became the keeper of the flame of her sisters’ reputations. She wrote a Biographical Notice of Emily & Anne that portrayed them as simple, innocent women who, spending all their lives in seclusion on the moors, had no idea of the consequences of their writing. Innocent in the ways of the world, they had no idea that their novels were so shocking. This is clearly untrue. Emily spent short periods working as a teacher & a longer period with Charlotte as a student in Brussels & Anne worked as a governess for some years. Charlotte wasn’t very impressed by The Tenant or Wuthering Heights. She refused to have The Tenant reprinted in her lifetime as she considered it a mistake. 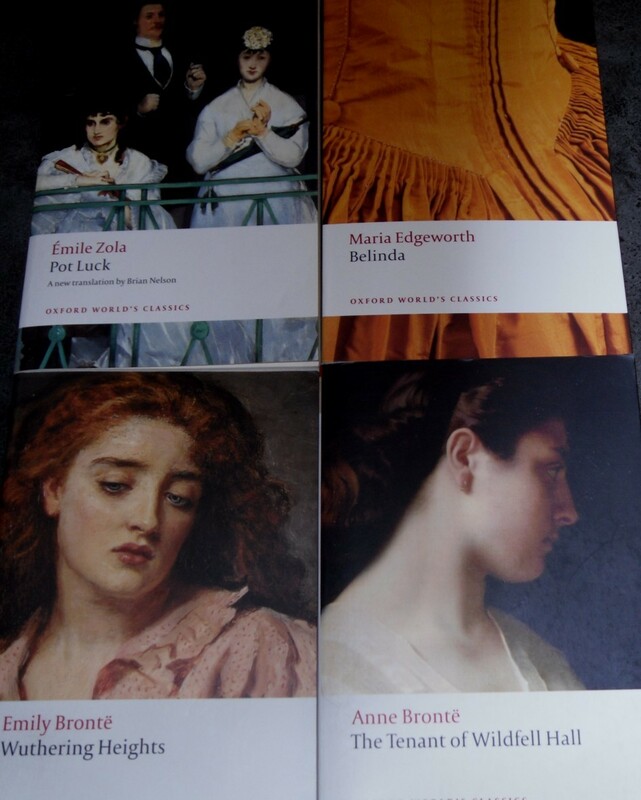 Both novels had shocked readers & critics & were partly responsible for the image of the Bell brothers (the pseudonyms used by the Brontes when they were first published) as coarse savages. I’ve read The Tenant several times but this latest read was with my online reading group. 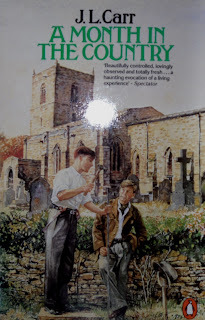 We read it in easy instalments, about 50pp a week &, although I did read two instalments in one day because I was stuck on a train, I managed to restrain myself until this last week where I read the final two instalments in a great rush. It’s the story of Helen, a young woman who is very sure of herself & has very decided views on many subjects, including marriage. She’s been brought up quite strictly by an uncle & aunt who have instilled strong religious views, although Helen, of course, thinks she knows better. When she falls in love with Arthur Huntingdon, young, handsome, rich, flippant & a bit of a devil, her aunt counsels caution. Helen, however, is confident that she can change his bad habits & instil some serious purpose in Arthur’s life. Their marriage is a terrible mistake. Huntingdon is a gambler, he drinks to excess, has no interests at all apart from hunting & encouraging his friends to drink, gamble & run up debts. Helen has a son, Arthur, but Huntingdon is jealous of her love for him & the amount of time she spends in the nursery. Later, as Arthur grows up, Huntingdon delights in teaching him to swear & misbehave. Helen’s life at Grassdale Manor is either lonely when her husband is in London with his cronies or unbearable when Huntingdon brings his friends home to drink, gamble & hunt. Helen’s efforts to restrain Huntingdon’s excesses finally alienate him altogether & he begins an affair with Annabella, the wife of his friend, Lord Lowborough. Helen plans to leave Grassdale, taking young Arthur with her, and, with the help of her faithful maid, Rachel, she does this. She moves to a remote part of Yorkshire & rents Wildfell Hall, a lonely house where she earns her living painting landscapes. Her efforts to remain secluded are defeated by well-meaning but nosy neighbours. The structure of the novel is reminiscent of Wuthering Heights. One narrative is surrounded by another. The novel begins in the neighbourhood of Wildfell Hall. Gilbert Markham, a farmer, is writing to his brother-in-law, Halford, about the circumstances of his early life & marriage. So we first meet Helen as Mrs Graham, a young widow renting the Hall. She arouses intense curiosity among the local families. Her reluctance to leave her son for any length of time, even to attend church, causes whisperings. When it is discovered that young Arthur has been taught to hate alcohol & be disgusted by the very smell of it, the vicar is horrified. Gilbert is initially repelled by Helen’s cold manner but he gradually befriends Helen & falls in love. He reacts jealously to her relationship with her landlord, Mr Lawrence & she hands him her Diary to explain how she came to Wildfell Hall & why she is so secretive about her past. Helen’s first person narrative through her Diary is the central section of the book. Then, after her escape to the Hall, Gilbert’s letter to Halford resumes with the story of what happens when Helen returns to her husband. I’ve always had a problem with Gilbert. He’s sulky, petulant & very ready to take offence at any perceived slight. When the novel opens, he’s courting the vicar’s daughter, Eliza, an empty-headed, spiteful girl. I have never understood what Helen sees in him. She’s so much more mature & intelligent than he is. Maybe the attraction is that he’s the complete opposite to Huntingdon? I think the structure of the book was a mistake. The male first-person narration never seems right to me. 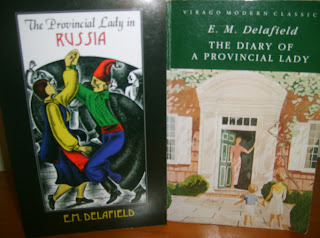 Helen’s Diary is so compelling, it would have been a more convincing novel if the whole book had been in Helen’s voice. She’s such a wonderful character. Self-righteous, over-confident at times but passionate, loving & strong. Anne must have been a remarkable woman. The time she spent working for the Robinson family exposed her to the highs & lows of living in Society. As she puts it in her Diary Paper of 1845, she had had “some very unpleasant and undreamt of experience of human nature.” This was partly because of the relationship between Mrs Robinson & Anne’s brother, Branwell, who also worked for the Robinsons as a tutor. Exactly what their relationship was is a bit of a mystery but Branwell believed that Mrs Robinson was in love with him & would marry him after her husband’s death. Branwell’s addiction to alcohol & drugs also influenced Anne in her realistic portrayal of Huntingdon & his friends. Anne wrote The Tenant to explore the consequences of the indulgence of boys & the sheltering of girls from reality. Helen’s realisation of her husband’s true nature is all the more horrifying because she has been sheltered from the world. Huntingdon (& Branwell by implication) were spoilt & cosseted from childhood. They had no mental resources to cope with temptation & were ruined by it. Their physical & spiritual wellbeing are placed in jeopardy. 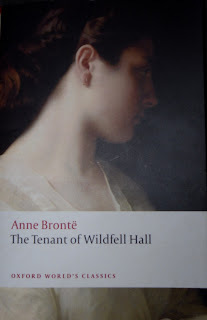 The scenes of drunkenness, blasphemy & adultery in the novel shocked the critics & led to The Tenant of Wildfell Hall being undervalued for many years. Some readers were more shocked by Helen’s audacity in leaving her husband than at Huntingdon’s cruel behaviour. If the book had been written by anyone other than a Bronte, it might have disappeared altogether. Fortunately Anne’s work has been re-evaluated in recent years & The Tenant can be seen as a powerful novel with serious themes. A masterpiece of Victorian literature. 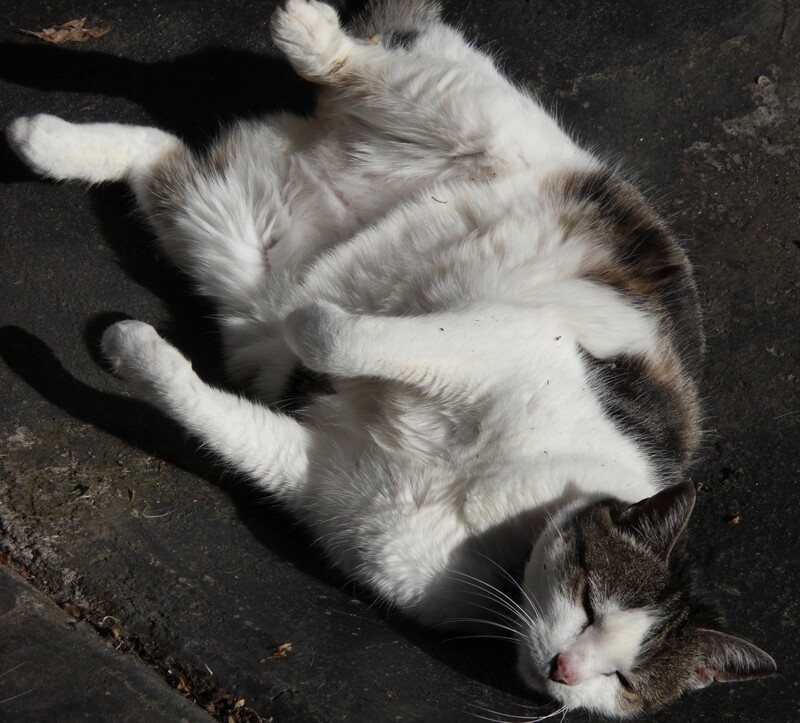 Here are a few photos of Abby relaxing on the back porch on this hot, humid afternoon. I was ironing in the kitchen (I'm not sure why this couldn't have waited until it was cooler...) and we're listening to a CD of choruses by Baroque composers. We've just had some Bach from the St Matthew Passion & now it's Handel's Messiah (All we like sheep have gone astra-a-a-a-a-ay). Have a lovely Friday wherever you are. It’s odd how a reference in an article can lead to a book on the tbr shelves. I was reading an article in a magazine about the relationship between Lady Margaret Kennedy, a 17th century Scotswoman & the Earl of Lauderdale, an influential politician of the time. In the article, it was mentioned that Lady Margaret was a cousin of Anne, Duchess of Hamilton & had lived in her house for some time, much to the dismay of the Duke of Hamilton who disliked Lady Margaret intensely. 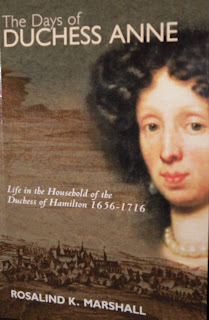 Anne, Duchess of Hamilton rang a bell in my mind &, at the end of the article, one of the sources mentioned was The Days of Duchess Anne by Rosalind K Marshall. Ah, I thought, I’ve got that book! I got it down, had a look in the index, saw that Lady Margaret only had a couple of mentions, but started reading it anyway & couldn’t put it down. By the way, this is also one of the ways in which I justify my groaning tbr shelves. If I hadn't bought The Days of Duchess Anne five years ago & put it on my Scottish history shelf, I would have missed out on a fascinating experience. Letters, accounts, memoranda and lists – all were carefully preserved by Duchess Anne, her husband, David Crawford their secretary and by successive generations of Hamiltons. I frequently found myself opening bundles of papers which had been undisturbed since the day three hundred years before when the 3rd Duke labelled them, tied them up with a leather thong and put them carefully away. If you think that a book derived from a thesis based on dusty documents would be a dull read, you’d be wrong in this case. The Days of Duchess Anne is a fascinating look at a noble household in Scotland & London on the later 17th century. Duchess Anne was Duchess of Hamilton in her own right, inheriting the title after the deaths of her father & uncle. She spent her early childhood in London but, after her mother’s death, she was sent to live in Scotland with her grandmother, Lady Anna Cunningham. This was fortunate as Anne learnt about the estate & its management from her formidable grandmother. Her uncle had been a fervent Royalist &, on his death, when Duchess Anne inherited the title & estates, her position was precarious. Her father & husband had contracted debts during the Civil War & her estates were confiscated by the Parliamentarians & handed over to Cromwell’s generals. Her title was also under siege by her father’s second cousin, the Earl of Abercorn, who claimed the estates were entailed & therefore, as the closes male heir, he should inherit. The resulting lawsuit, which Duchess Anne eventually won, was very expensive. Anne was supported in all these griefs by her new husband. She had married Lord William Douglas, Earl of Selkirk. This was a surprising match as she was a Presbyterian & he was Catholic. Selkirk seems to have married for her estates & been willing to convert to Protestantism. Whether their relationship was initially based on love is difficult to know but their marriage certainly became one of great affection & mutual support. They were both committed to the restoration of the Hamilton estates (Selkirk was created Duke of Hamilton by Charles II at his wife’s request) &the detail of how they restored their fortunes & improved the estate is fascinating. They had a large family, seven sons & three daughters survived childhood, & their household also included other relatives, often young nieces & cousins. The picture of a noble family on their estates is bolstered by the details of how the estate was run. This is where the careful research into account books brings Duchess Anne to life. There are chapters on Hamilton Palace, the building work & furnishings commissioned by Duchess Anne; how the household was run, the servants, some of whom stayed for life or were part of the wider Hamilton family; the food the estate provided & what had to be bought elsewhere; how the family entertained, travelled, played & spent their time. Fumbling his way through a maze of feminine terminology, the Duke knew despair. Sometimes he was not even certain what type of garment he was ordering. There was the regrettable occasion when he asked the dressmaker to make up a ‘sallantine’ and the fellow did not seem to know what was meant... At last he wrote home in a rage to the Duchess, declaring that ‘your “sallantine” I neither know what it is you mean by it nor can I find anybody that knows what it is, so explain yourself by the next (letter).’ The Duchess replied at once, pointing out somewhat tartly that he had misread her writing. As everyone knew, the word was ‘palatine’, that highly fashionable accessory, a furred scarf. Even then he found himself in difficulties over the price he should pay for the palatine & how much he should pay for the silk & ribbons she also wanted him to buy. I can just imagine him furiously scribbling his queries, frustrated & bamboozled by the foreign realm of women’s clothing. I loved the details of how the shopping was done & then, how the goods were sent back to Scotland. The pros & cons of coach travel versus shipping are explored as well as the Duke’s worries about the astronomical cost of everything in London compared to Edinburgh or Glasgow. Still, he was a fond father & always returned with “bonny things for the bairns”, toy trumpets & swords, or material for dolls clothes to be made up by his tailor. The Hamilton’s Great Design for their estates was almost frustrated by the problems they had with their eldest son & heir, James, Earl of Arran. As is often the case, parents & son had completely different temperaments & personalities & the generation gap was alive & well in 17th century Scotland. Arran was a frivolous young man who, after a taste of Court life, had no desire to settle down in Scotland to learn estate management. He went on the Grand Tour, ran up a lot of debts & spent a lot of time pursuing heiresses without really wanting to marry. He was an unsatisfactory son in many ways. When he did finally marry, his young wife died in childbirth, leaving him with a daughter who was brought up be her grandmother while Arran returned to his bachelor life in London. He did eventually marry again & have a son, but spent the last years of his father’s life plaguing him for more money & trying to force Duchess Anne to give him the title of Duke as soon as his father died. Anne resisted this as she knew that she had to keep control for the sake of the estate's future & feared that Arran would just use the estate to finance his extravagant lifestyle. The Days of Duchess Anne is an absorbing book. A family saga full of marriages, births, quarrels & reversals of fortune, it’s also a picture of life on a noble estate in Scotland in the later 17th century. On the back of this new volume of Nella Last’s Diaries, there’s a quote from Simon Garfield, editor of several collections of Mass Observation diaries. “It’s wonderful to be back in Nella’s world again.” I completely agree! Nella Last was a housewife in Barrow-in-Furness on the west coast of Britain during WWII & after. Her Diary were written for the Mass Observation organisation. In the late 1930s, M-O asked for volunteers to keep a diary of their everyday lives & send it in to the M-O office so that they could get an idea of what ordinary people were thinking. This was in the days before public polling & surveys were taken. Over the last 30 years, several diaries written for M-O have been published as well as themed collections focussing on women’s writing or wartime. 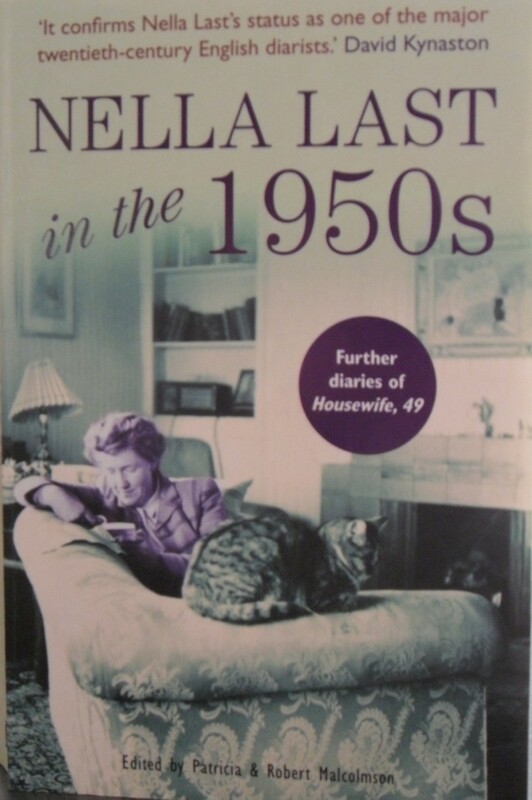 Nella’s Diary, begun in the late 30s was kept until the end of her life in the late 1960s. It was one of the most extensive, detailed & compelling accounts of life in Britain in the mid twentieth century. Nella always wanted to be a writer & she would be amazed to think that her Diary,sent off to London every few weeks, has been published. I find the details of Nella’s domestic life fascinating. I slipped back into Nella’s world very easily when I started reading this latest volume. 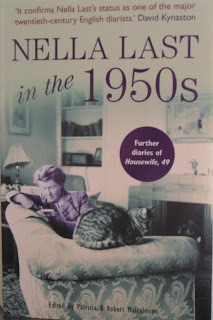 I read Nella Last’s Peace, the Diary of the late 1940s, earlier this year & I could hardly wait to get hold of this next volume. Nella is in her 60s now. Her sons have left home. Arthur lives in Ireland with his wife, Edith & their sons, Peter & Christopher. Cliff has emigrated to Australia & is a sculptor. Their visits to Barrow during the course of this Diary are great periods of happiness for Nella. She certainly needs her happiness as her everyday life is clouded by the mental illness of her husband, Will. She always refers to Will as “my husband”, occasionally “my poor man”. Will seems to be chronically depressed. Nervous, anti-social, afraid to go out but resentful when Nella does, her life revolves around not upsetting Will. Anything that causes him stress will only make her life more of a burden. She does snap sometimes & tells him a few home truths, getting on her top note, as she calls it. Will’s only pleasure is his car & luckily this means that Nella can frequently get out to the Lake District she loves. Drives to Coniston Water to walk by the lake & eat a picnic are the highlight of her life. This entry really encapsulates Nella’s life. The domestic details of her cooking, planning a trip to the coast or the Lakes, choosing library books (nothing too upsetting or violent for Will), her love of Nature & thankfulness for small blessings such as Will having his new glasses at last so that she doesn’t have to read aloud to him anymore. Life in Britain in the 50s was pretty bleak. The threat of nuclear war was ever-present. Only a few years after the end of WWII, it was horrifying to think that it could all start again. The beginning of the Korean War was a frightening time as people feared that the US or the USSR would use atomic bombs to resolve the conflict. Memories of the devastation of Hiroshima & Nagasaki haunted Nella. The Women’s Voluntary Service that Nella joined during the War was still going & she went to classes in Civil Defence in the anticipation of another war. Economically times were hard. Rationing hadn’t ended with the War. Soap, petrol & sugar rationing were still in force during this period & Nella continually complained of the struggle to make ends meet. Will’s retired from work & sold his business, then spent all his time worrying that they were living on capital & their money wouldn’t last them out. Nella had a little income of her own from her father & often says that this kept her sane when Will accused her of spending too much money. She was a very thrifty woman, often listing the costs of goods & how she scrimps & saves to find a cheaper alternative. Neighbours & relatives make frequent appearances in the Diary. A neighbour’s daughter-in-law, Sheila, contracts polio. Pregnant & only 23, Sheila is almost completely paralysed. Her sad story is told over several entries & it reminds the reader of how horrible a disease like polio could be. The sudden onset & the paralysis left afterwards. Nella isn’t above making a few censorious comments about neighbours not as thrifty or careful as herself but she’s a caring neighbour, always ready to help friends such as the Helms & the Atkinsons. I’m especially fond of Nella’s Aunt Sarah, an old lady in her 80s who still lives on her own with her cousin, Joe. Aunt Sarah & Joe have very little but never complain, living in the country as they’ve always done. I’m sure Nella did too! I think Nella used the Diary as a way of releasing the built-up tension of her day. She & Will had separate rooms & she would sit up in bed at night, writing up her Diary. Even so, it’s not just a litany of complaints about Will, her feckless neighbours & the rising price of everything. There’s also much happiness in her sons & grandchildren, Nature, the many craft projects she delights in, her cats, Murphy & Shan We & her good friends. It’s been a great joy immersing myself in Nella’s life again. She has such a distinctive voice & her Diary is a compelling picture of life in 1950s Britain. 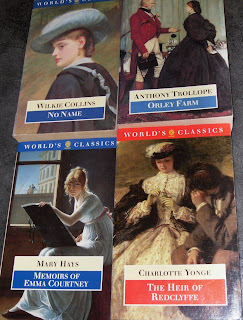 The other day I posted about the Penguin & OUP Classics lists & how much I love the covers, fonts & paper of some incarnations better than others. 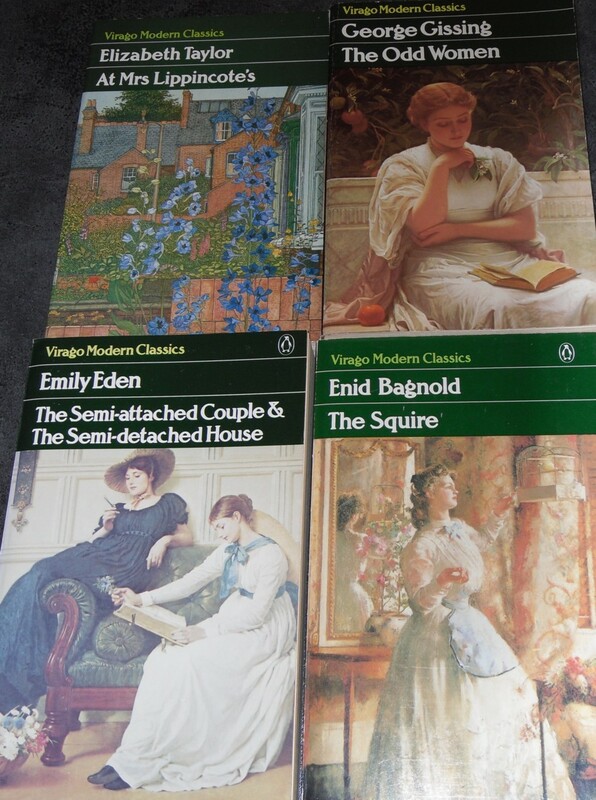 I meant to mention Virago Modern Classics, maybe the iconic imprint of the last 30 years, but the post was long enough already so I left it for another day. I've posted about the beauty of Persephone & Hesperus books in the past & I do think the physical look & feel of a book is important. Although, after reading some of the comments on my earlier post, I'm feeling a little more tempted by an e-reader. 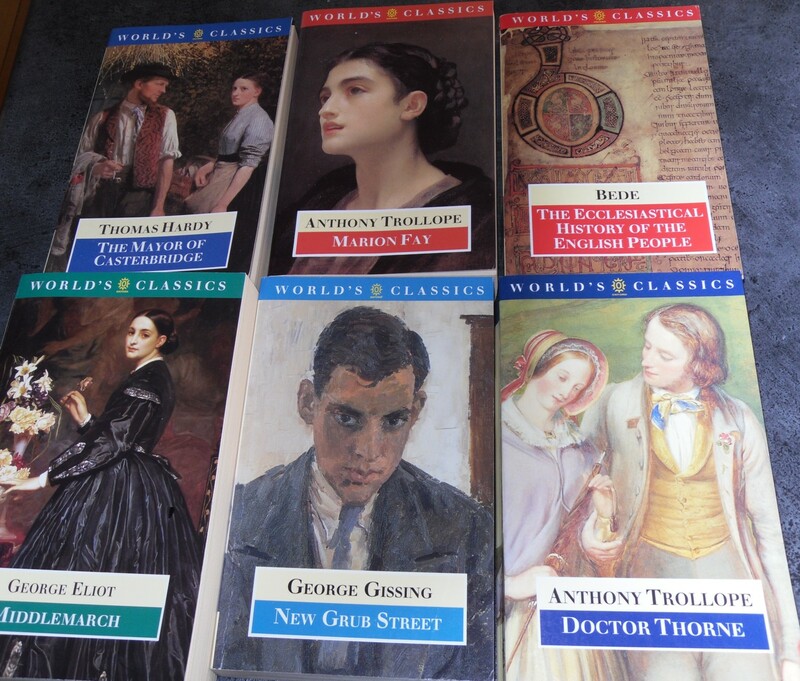 The thought of all the out of print classics out there - especially from the 18th & 19th centuries - is very tempting. Dovegreyreader mentioned Girlebooks, a wonderful site with lots of books by my favourite authors. Like many other readers, I have a great fondness for the original green covers of the VMC list. It's difficult to find VMCs here in Australia in secondhand shops but whenever I do, I grab them. 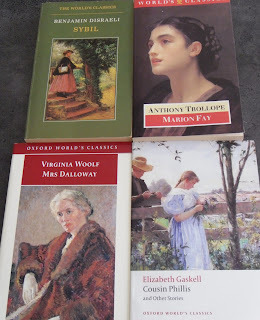 During the celebrations for Virago's 30th anniversary last year, I read many articles & blogposts about the passion readers have for the original covers. Some of it may be nostalgia, remembering the overwhelming feeling of relief that suddenly we could read all these wonderful women authors that had been overlooked by publishers for so long. But, the original editions were also beautiful objects. The illustrations were chosen so carefully & the apple green spines & covers were instantly recognisable. I wish that, instead of the hardbacks Virago chose to publish last year to celebrate the anniversary, they'd reprinted some of those original hard-to-find titles from the early years. We all have our list of Viragos that we scour secondhand bookshops for. I also like many of the later incarnations & even some of the modern ones. The Barbara Pyms are fine but the new Elizabeth Taylors leave me cold. How can they compare with the gorgeous paintings used originally or even the floral paintings used slightly later? Still, ultimately it's the contents that matter, & Virago broadened my reading as no other publisher had up to that point. 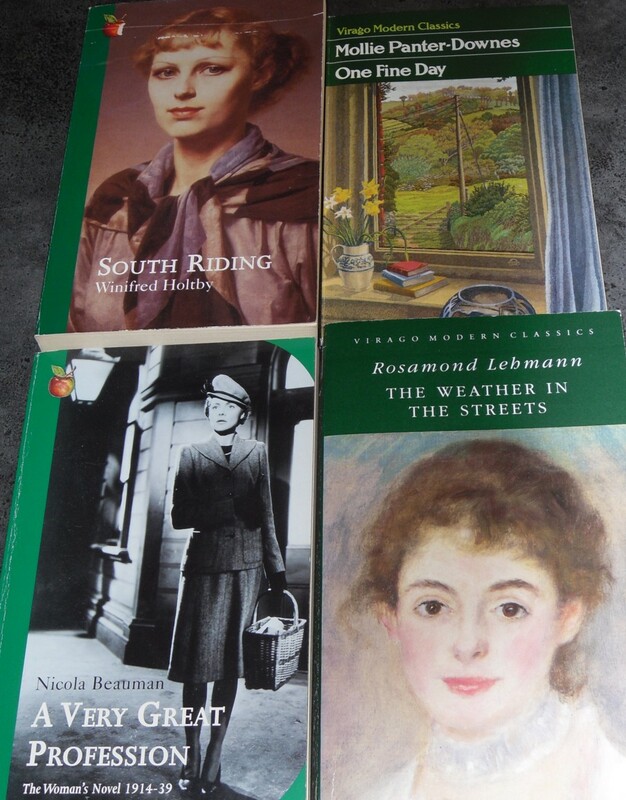 Rosamond Lehmann, Elizabeth Taylor, Elizabeth von Arnim, Kate O'Brien,Vita Sackville-West - if I'd heard of them, I'd never read any of their books. Virago changed all that. 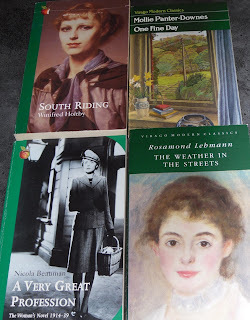 Not until I discovered Persephone Books in 1999 have I found so many new favourite authors. 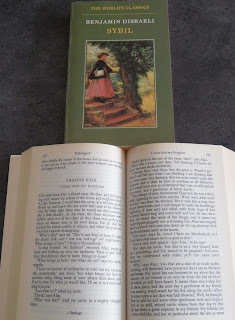 Anyone interested in Virago should have a look at Verity's Virago Venture, a terrific blog. Verity is attempting to read all the VMCs, more than 500 of them. A challenge indeed! The archives are a great read. Thrush Green is the first book in this series by Miss Read. I’ve listened to several others in the series on audio but then decided I should start at the very beginning. I’ve been tempted by these lovely Houghton Mifflin American paperbacks (although still with the beautiful original drawings by J S Goodall) so I have the first two books on the shelves. 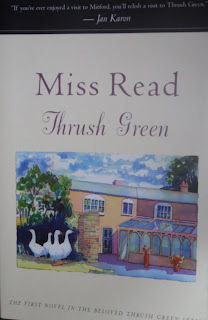 This first book takes place over one day, May Day, when the fair run by the formidable Mrs Curdle, comes to Thrush Green. As morning breaks, the caravans arrive with the stalls, rides, animals & games. Mrs Curdle has been coming to Thrush Green for many years but there are rumours that this will be the last year. She’s getting old & her health isn’t good & she doesn’t feel that she has anyone to hand the running of the fair on to. Her grandson Sam is a bad lot & her other grandson, Ben, has been sullen & out of sorts for months. Mrs Curdle looks forward to consulting old Dr Bailey, the only doctor she trusts after he safely delivered her son, George, many years ago. Dr Bailey is also feeling his age &, after a bout of illness, is trying to come to a decision about his practice. He has a young GP, Dr Lovell, helping out & he wonders whether he should offer him a partnership. Dr Lovell is enjoying his time in Thrush Green very much, especially since he met beautiful Ruth Bassett. Ruth is staying with her sister & brother-in-law after her fiancé left her just before her wedding. Her broken heart is mending slowly & Dr Lovell is hoping that he can spend more time in Thrush Green to help with that healing. Grumpy Albert Piggott makes his daughter, Molly’s, life a misery with his complaints & bad temper. She has started working at a pub some distance away, only coming home at weekends, but her hopes are centred on the fair. Last year, Molly & Ben Curdle spent an enchanted day together & she has waited all year to see him again. Bossy, dogmatic Ella Bembridge & her timid friend, Dimity Dean, have several dramas to cope with over the course of the day & eccentric Dotty Harmer causes Ella some pain with a case of Dotty’s Colliwobbles after eating some of her quince jelly. This is a lovely, gentle book, introducing most of the Thrush Green characters. Before the day is over, decisions will be made that affect the lives of several residents of Thrush Green. Reading books out of order can have its downside. I was pleased to find out in this book why Dotty’s cat was called Mrs Curdle. This had puzzled me as I’d read a couple of the later books in the series & had no idea who Mrs Curdle was & why a cat would have such an unusual name. Perfect comfort reading. It may not look like the most comfortable place to laze around but Abby loves to lie on the drain hole at the bottom of my little back yard. It's her first port of call on sunny mornings. My block has a slope & the drain is, of course, at that lowest point to let gravity do its work when it rains. It's a good place to roll around scratching one's back & hoping I'll come out & give her a stroke & a cuddle. Actually that last photo isn't the most flattering one ever taken of Abby, she looks enormous. You can see her looking at me very dubiously in the second photo, wondering why I'm standing at the top of the stairs with the camera. 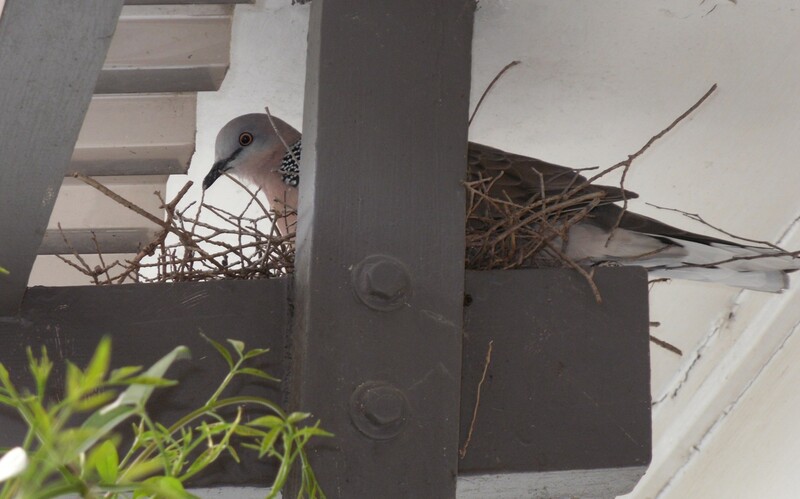 We have a pair of doves who visit each spring & they're back again this year. They return to the nest they built a few years ago on the back porch under the eaves. Sadly, I've never see any young ones so I don't know if there are eggs in the nest or not. It's in such an awkward spot that I can't see inside. It's lovely to hear the male dove running along the top of the porch & hear them both cooing. Well, back to work tomorrow after a lovely, relaxing week off. 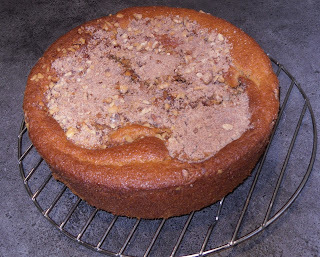 I'm still coming to grips with baking in the gas stove & I've just taken a Coffee Crumble Cake out of the oven. If it turns out well, I'll post a photo later. 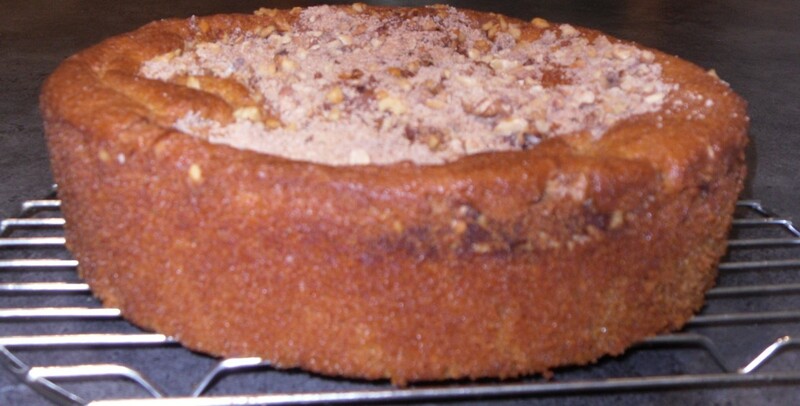 It was a gorgeous mixture with sour cream & a soft, fluffy batter. All the crumble topping seems to have ended up in the centre but I'm a bit worried about getting it out of the tin. I didn't have a springform tin so used an ordinary one. Fingers crossed. Later - well, it looks pretty good. 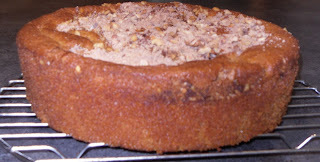 I did lose a little of the topping turning it out but it was much better than I thought. There'll be some happy librarians at morning tea tomorrow! I've been thinking about e-books & e-readers lately. The pros & cons. I'm not even a little bit tempted by an e-reader in my everyday life but I do think it would be useful in some circumstances. I can see myself using one if I travelled a lot. There might be room in the suitcase for a few more essentials like shoes if the first consideration of packing wasn't which books to take & how many? Travel guides would be much more practical on an e-reader if it was of a size to pop in a bag & carry with you all the time. I know the ability to increase the font size is a great benefit to many people. But, the greatest loss to me would be losing the physical book. The author of an article I read somewhere recently was almost lyrical in his praise of the physical book. I love to fully examine new books. If they're non-fiction, I look at the pictures, read the Introduction & the Bibliography, check the Index to see how much I'll find about authors or subjects I'm especially interested in. All this before the book is either read immediately or shelved for another day. Then, when I was rearranging my tbr shelves the other day, I found myself looking at the different covers of classics from OUP & Penguin from different eras of cover design. 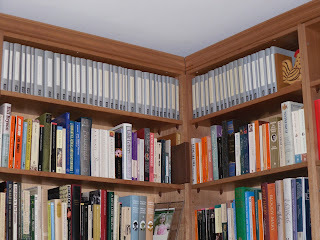 You can see four different styles of Penguin Classics above. This is something else I'd miss if I no longer had the physical book, if it was just loaded onto an e-reader. The books on our shelves also say a lot about who we are. Sometimes it's a way to show off, sometimes it's a way to give an impression of the person you wish you were. 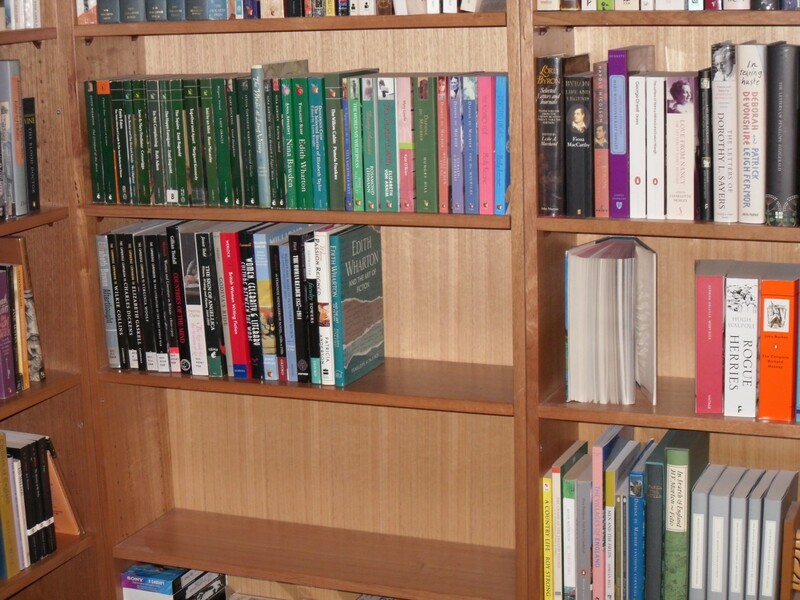 I've been told that the walls of bookshelves & hundreds of books in my house will make it very difficult to sell. Too many books put off prospective buyers. To me, too few books would make a house unliveable. 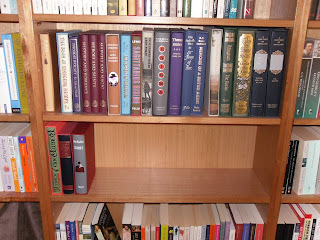 Looking at the classic covers on my tbr shelves set me off collecting books from all my bookshelves. I found lots of favourites so I thought I'd share them. This is the latest version of the Penguin Modern Classics, replacing the older version with the silver or green spines. I love these. The paper is so white & crisp. 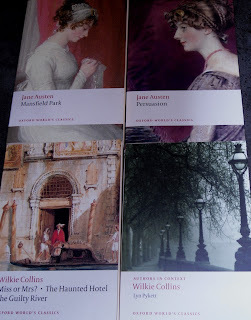 Much as I love Penguins, I love Oxford University Press Classics even more. This is the oldest version I have from the early 1980s. I love the font of these books (it's a bit hard to see in the photo) & the way they lie so beautifully in the hand without needing to crease or break the spine to read comfortably. 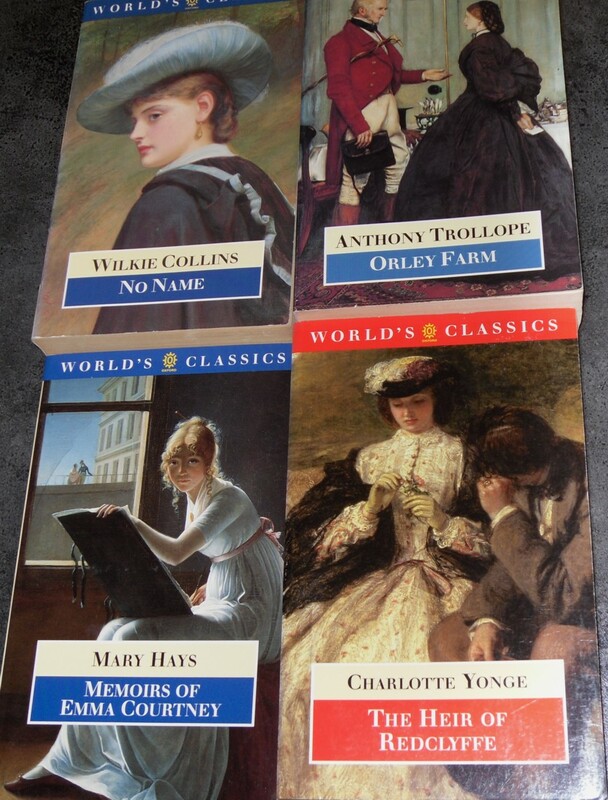 My favourite OUP covers are these from the 1990s.Again, the books themselves are easy to read, the font is readable & the paper is a lovely cream. 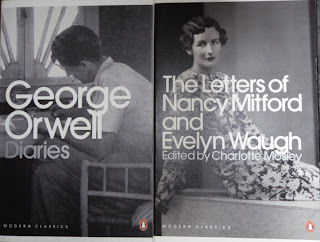 Then, OUP changed to the design used for Mrs Dalloway here, my least favourite. I always found these books quite stiffly bound & the font a little small. The latest version of the OUP Classics is just beautiful. I love them almost as much as the 90s version. I've found myself buying new copies of books I already own just because the OUP cover is so lovely. I also like reading different Introductions & Notes for classic novels so I do have some excuse for having more than one copy. I had a lovely time trawling the shelves for all these books, admiring the covers & remembering how much I enjoyed reading the contents. I haven't even mentioned other publishers whose books are prized for the beauty of the object as well as the contents - Virago, Persephone, Hesperus. While publishers continue to produce such gorgeous objects, I'll continue to resist the convenience of the e-reader. 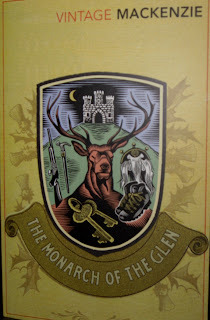 I listened to most of The Monarch of the Glen on audio, narrated by the wonderful David Rintoul. But, I haven’t been at work this week so I haven’t been in the car listening to my audio book of the moment. I was having Monarch of the Glen withdrawal symptoms so, as I also had a copy of the book, I read the last 60pp or so on a cold afternoon earlier this week. 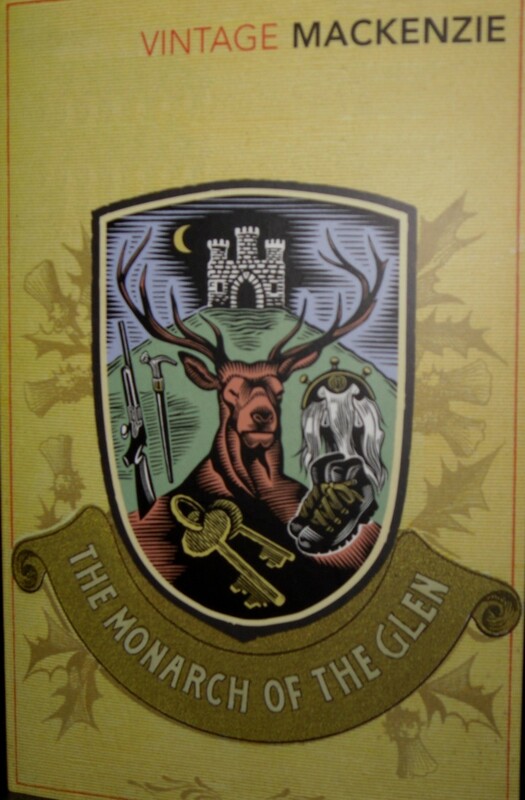 I was seduced by the lovely Vintage reprint of Monarch of the Glen a few months ago when I read Desperate Reader’s enthusiastic review. The Monarch of the title is Donald MacDonald of Ben Nevis (known as Ben Nevis). He’s the Laird of Glenbogle Castle & a vast estate in the Highlands. He’s married to Trixie, has two hefty daughters, Catriona & Mary & three sons, Hector, Murdoch & Iain. Ben Nevis is playing host to a distant relation from Canada, Carrie Macdonald & her immensely wealthy American husband, Chester Royde Jr. Chester’s sister, Myrtle, is also in the party & Ben Nevis decides that Myrtle would be the perfect wife for one of his sons, preferably the eldest, Hector. Carrie’s ancestors were driven from their croft during the Clearances, but she doesn’t bear a grudge & is learning Gaelic from a book called Gaelic Without Tears as she wanders soulfully over the estate looking for the ruins of her ancestor’s croft. Chester is just as enthusiastic about everything Scottish as Carrie & decides to buy a hunting lodge for future holidays. Ben Nevis & his impoverished neighbour, Hugh Cameron of Kilwhillie, decide that Knockmacolly, Kilwhillie’s dilapidated lodge would be perfect. Chester also decides to surprise Carrie by wearing a kilt of his own design to the Glenbogle Gathering, the local Highland Games hosted by Ben Nevis every year. However, everything could be upset by the war between Ben Nevis & the hikers, members of the National Union of Hikers, who ignore the many signs around Glenbogle forbidding camping & frighten the birds on the Glorious Twelfth of August with the loud music from their radios. As well as the hikers, Ben Nevis has to defend his property from the Scottish Nationalists roaming the Highlands. Carrie meets up with two of these renegades on her solitary walks & is especially taken with Alan Macmillan, a handsome young poet. The scene is set for scenes of culture clash between brash Chester & his hosts – Chester’s first experience of stalking is very funny. The great stag, the Muckle Hart of Ben Glass, is elusive & Chester finds himself crawling on his belly for miles across bog & heath. Ben Nevis & his retainers capture & imprison the hikers who have ruined their sport but this leads to a great meeting of the NUH at the Astrovegetarian Hall in London, where revenge is planned by the free-spirited hikers against the oppressive landed gentry, represented by Ben Nevis. Ben Nevis’s plans for Myrtle to marry one of his sons may also be thwarted when she meets the handsome poet. This is such a funny, witty book. Mackenzie pokes gentle fun at everyone from brash American millionaires to soulful poets to egalitarian hikers. I think I enjoyed it even more because David Rintoul’s narration was fantastic. He handles the varied accents beautifully. Ben Nevis’s barking, Trixie’s booming & Duncan the ghillie’s gentle Highland accent were perfect. I especially loved his rendition of the Hikers’ Song as sung by the Secretary of the NUH, Mr Prew. Vintage have also reprinted Whisky Galore, Compton Mackenzie’s most famous book. But, my library has the audio book read by Ken Stott. I don’t think I can resist that! Sheila Radley wrote 10 detective novels in the 1980s & 90s featuring Detective Chief Inspector Douglas Quantrill. The books are set in the fictional town of Breckham Market, set in Suffolk but based on her home town of Diss in Norfolk. I vaguely remember the series from my library but I’ve really only discovered them through the reprints by the wonderful US publisher, Felony & Mayhem. So far, they’ve reprinted nos 1,2,3 & 5 (why not 4?) & I’ve read the first 3. 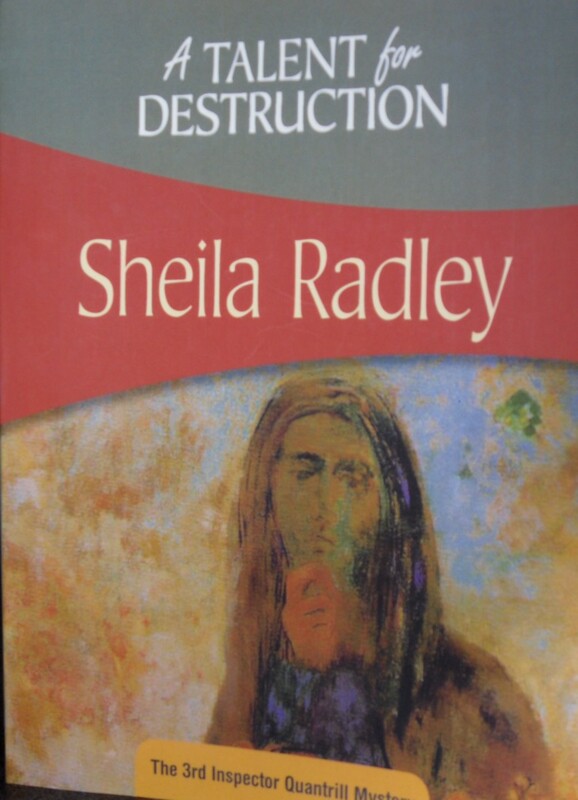 A Talent for Destruction is the 3rd in the series & I think it’s the most impressive. I love mysteries set in villages & small towns, especially if they have a churchy element. A Talent for Destruction ticks all those boxes & it begins in winter, my favourite season for mystery & murder. DCI Quantrill is a middle-aged man, married with teenage children. His son, Peter, is a bit of a tearaway & has been accused of vandalising the local community hall. The investigation will be undertaken by someone else but Quantrill visits the Rector, Robin Ainger, to discuss the problem. He also meets Gillian Ainger, seemingly the perfect clergy wife. The Aingers are well-respected in their parish, hard-working & always available to help with any problem. Their personal relationship seems a little strained by Gillian’s father who lives with them & is becoming a little senile. When two boys interrupt Quantrill’s visit with the news that they’ve uncovered a skeleton while tobogganing in a nearby field, Quantrill investigates the case. He’s immediately suspicious that the Aingers know more than they’re admitting but they stick to their story & he can’t shift them. The body is that of Athol Garrity, an Australian backpacker travelling in Europe who camped in the field with the Aingers’ permission during the previous summer. Another Australian, Janey Rolfe, had also become a frequent guest at the Rectory after befriending Gillian. 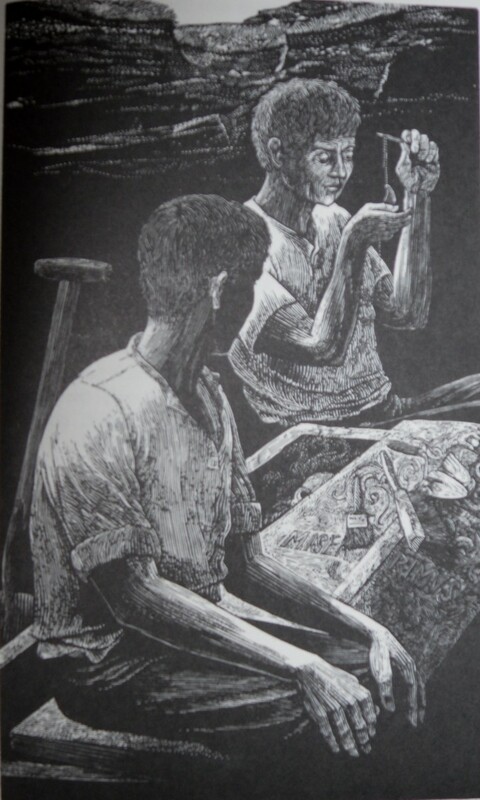 Janey was a student who moved on to the US around the same time that Athol disappeared. Could there be any connection? Who had a motive for killing Athol? He was a loud young man, obnoxious when drunk, but he seemed to have only a very limited connection with the Aingers. What lifts this novel from a more conventional police procedural is the lengthy flashback section in the middle that takes us back to the summer before, when Athol & Janey arrive. This section takes us inside the Ainger’s marriage & begins to explain the tension Quantrill was aware of when he first meets them. The solution to the mystery is very satisfying. I feel in the mood for murder at the moment. I have a lot of mysteries on the tbr shelves & when I was moving them around the other day I picked up A Talent for Destruction. Anyone interested in classic British mysteries should have a look at Felony & Mayhem’s website. They’ve reprinted many classic authors from the Golden Age such as Margery Allingham & Edmund Crispin. They’ve also reprinted authors from the 70s & 80s who have fallen out of print. Sheila Radley is one, but they also have Caroline Graham’s Midsomer Murders books, Robert Barnard (another of my favourites) & Reginald Hill. I've taken the week off work to have a bit of a break & catch up on some of those jobs that just don't fit into a weekend. I've been running out of room on the tbr shelves for a while now so a little rearranging was in order. I have four walls of bookshelves in two rooms so I'm slightly ashamed to say I'm running out of room - but it's true! The top shelves are slightly smaller than the others so I'd left them empty because I shelve my books alphabetically & I don't like having to put larger books spine up if they won't fit vertically. I had shelved my Persephones together on the middle shelves of one wall but I realised they would fit on the top shelves so I now have them running along the top of the shelves in one room. There's room for more & hopefully Nicola won't stop at 100 or 120 as I read in a few interviews recently. Of course, if she doesn't stop, I'll have to rethink the arrangement... but that's a few years away. This gave me four extra shelves to play with so I moved everything up & I now have nearly a whole wall of tbr shelves. I also moved lots of CDs & DVDs into storage boxes that fit under the bed which made even more room & you can see the result. I like to have my tbr books in categories. I can't help it, I'm a librarian. 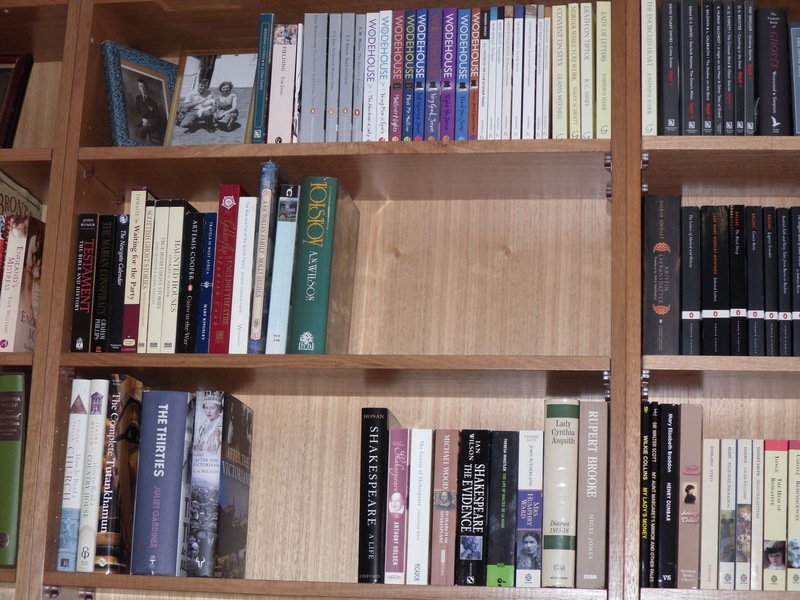 So you can see the Viragos & the literary criticism above next to literary biography & letters. 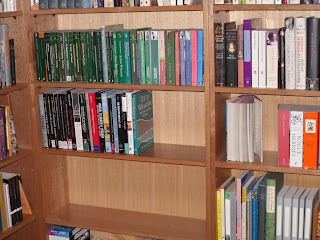 Then, I've grouped together my bargain Wodehouses, Hesperus, Greyladies & you can see a few of the Penguins & OUP classics. 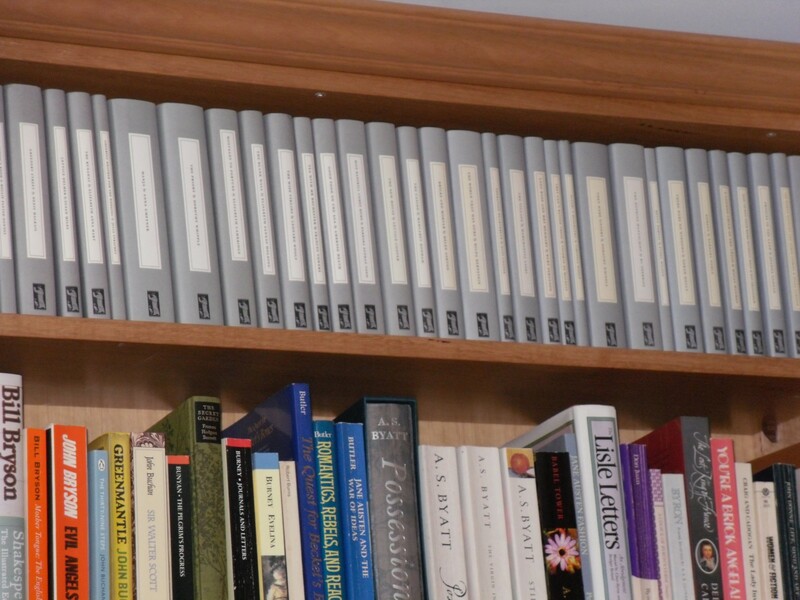 I've also made more room for the Folio Society books after I was tempted to rejoin by the spectacular offer of the E F Benson boxset of Mapp & Lucia for just $9.95! This set is usually worth nearly $300. I did have to buy four more books but my online bookgroup has several Benson fans, including Elaine from Random Jottings & Simon from Stuck-in-a-Book, so I couldn't resist. You can see the boxset in Simon's post but I think my set are in different colours so may be a later edition. I'll post a photo when they arrive. The books are illustrated by Natacha Ledwidge who has also illustrated the Dorothy L Sayers boxset that the Folio Society tempted me with a few years ago. But, Nature abhors a vacuum as they say, so how long do you think it will be before I order a little something from the Book Depository to fill up some of that empty space? Especially as I have a 10% off voucher & the exchange rate is still excellent? Don't bother to answer that! 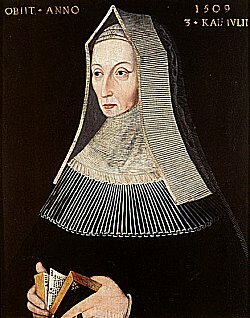 I’m a confirmed Yorkist so, while I know lots of scurrilous facts about Margaret Beaufort, mother of Henry VII, courtesy of the many books I’ve read about Richard III, I’ve never read a biography of her. So, I was pleased to come across this new biography by Elizabeth Norton. Margaret was an ambitious woman who put her considerable energies into helping her son to the throne of England. Margaret’s family, the Beauforts, were descended from the adulterous relationship between John of Gaunt, uncle of Richard II & Katherine Swynford. Although they eventually married, this in itself wasn’t enough to legitimise their children. Richard II did legitimate the children as a favour to his powerful uncle, never imagining that they would be close enough to the throne to cause a problem. However, when Henry Bolingbroke, son of John of Gaunt, usurped the throne in 1399, he stipulated in an Act of Parliament that his half-siblings had no rights to the throne. The Beauforts were loyal to the Lancastrian royal family & were well-established in the nobility by the time of Margaret’s birth in 1443. Her father was the first Duke of Somerset & Margaret was a great heiress. She married four times, the first when she was only six years old. This marriage was dissolved when the young husband, John de la Pole’s, family was disgraced. Margaret was married again at the age of 12 to Edmund Tudor, a half-brother of Henry VI. The Tudors were the children of Catherine de Valois, widow of Henry V & Owen Tudor. Tudor was much lower in rank than the Queen & the marriage was a scandal. Catherine’s son, Henry VI, was fond of his half-siblings, & took them into his household, granting them titles & planning good marriages for them. Edmund was made Earl of Richmond & Margaret was considered an excellent match for him. An indication of Margaret’s religious nature comes from a story told later by John Fisher, Margaret’s chaplain. She told him that she was inspired by a vision of St Nicholas in a dream to accept Edmund’s suit, although in reality she would have had little choice in the matter. Although it was customary for very young girls to be married, the marriages were not usually consummated until the girl was older, especially as Margaret was considered quite small for her age. Edmund Tudor was anxious for an heir & he did not wait. Margaret almost immediately became pregnant & six months into her pregnancy, her husband died of the plague. At the age of 13, she was a mother & a widow. Her son, Henry, became the focus of her life. Although she married twice more, she had no more children, & it was said at the time that this was due to the physical trauma she suffered giving birth at such a young age. This is a possible portrait of Margaret as a young woman (from flickr.com). Margaret’s next husband, Henry Stafford, son of the Duke of Buckingham, was chosen by Margaret & her brother-in-law, Jasper Tudor. Margaret & the Tudors were firmly in the Lancastrian camp & with the rise of Richard, Duke of York, the Wars of the Roses were about to begin. I’m not going to go into the machinations of the Wars. Everyone is called Richard, Edward, Elizabeth, Henry or Margaret & it’s very confusing! I’ll concentrate on what Margaret was doing rather than who won which battle. Margaret’s marriage to Stafford seems to have been happy. Her son, Henry, was in the care of his uncle Jasper Tudor, & Margaret kept in contact with them both. As Henry VI slid into periods of madness & the Duke of York pressed his claim to the throne, Margaret & Stafford tried to stay clear of trouble. Eventually, after the Battle of Tewkesbury in 1471 when Henry VI’s only son, Edward, Prince of Wales, was killed, the Lancastrian cause seemed lost. Henry VI had been imprisoned in the Tower of London by the Yorkist King Edward IV & after his son’s death, he was quietly murdered. The only possible candidate left on the Lancastrian side was Margaret Beaufort & her son, Henry Tudor. Although their Beaufort claim was dubious, Henry VI had apparently considered making Edmund Tudor his heir before the birth of his own son & so there was a possibility that Henry Tudor could stake his claim. In the 1470s, this was unlikely. The Yorkists had won decisively & Henry & Jasper Tudor fled into exile in Brittany. Margaret accepted the status quo & she was more concerned with the death of her husband, possibly from wounds he suffered during the Battle of Barnet. Margaret realised she needed a protector in the volatile political situation & less than a year after Stafford’s death, she married for a fourth time. Her husband was Thomas, Lord Stanley, a man with strong Yorkist connections. He was a bit of a slippery customer though & had managed to avoid actually committing himself in battle to either side throughout the Wars. Margaret & Lord Stanley were accepted, if not trusted, by Edward IV. Everything changed when Edward died suddenly in April 1483. His young son, Edward V was swiftly deposed by his uncle who became Richard III. Suddenly, the opportunity the Tudors had been waiting for had arrived. Richard’s usurpation had not been a popular move & the rumours that he had murdered his nephews in the Tower led to a rebellion in late 1483 headed by the Duke of Buckingham, a connection by marriage of Margaret. This is when Margaret’s reputation as a political schemer & intriguer stems from. She had been in communication with her son although she hadn’t seen him for over ten years. Although Buckingham’s rebellion failed, Margaret conspired with Elizabeth Woodville, Edward IV’s Queen who had been stripped of her property & titles by Richard III. The two women decided that Henry should marry Elizabeth’s eldest daughter, Elizabeth of York. Although Richard had declared the Woodville marriage illegal which made the children illegitimate, most people still considered the children of Edward IV the rightful heirs. If Henry & Elizabeth married they would unite the claims of York & Lancaster. Margaret was central in the plot that saw Henry invade England in August 1485 & defeat Richard at Bosworth. Margaret was content for Henry to claim the throne through her as no woman could have successfully claimed the throne at this period. She styled herself The King’s Mother & was treated as Queen Dowager in all but name. She began signing her letters Margaret R which could have stood for Margaret Richmond or could have been meant to be mistaken for Margaret Regina. Although mother & son had seen little of each other, Henry knew how much he owed Margaret & they seem to have been genuinely fond of each other. Henry married Elizabeth of York to consolidate his claim but Elizabeth seems to have been dominated by Margaret who was certainly a forceful personality. The photo above (from talesofcuriosity.com) is of Henry & Elizabeth's gorgeous tomb in Westminster Abbey, sculpted by Pietro Torregiano. Margaret spent the years of Henry’s reign using her influence to further her pet projects. She was very interested in education & supported two colleges at Cambridge University – Christ’s College, which she founded, & Queen’s College, which had been supported by previous Queens of England. She was encouraged in all this by her chaplain, John Fisher, who later became Bishop of Rochester & was executed by Henry VIII. Fisher seems to have been genuinely fond of Margaret. He certainly admired her for her piety & her support of learning & preached her funeral sermon. Norton quotes extensively from this sermon & it certainly humanises Margaret. Very few of her letters survive &, as with most medieval women, it's difficult to really hear their own voices. Margaret’s religious leanings became more pronounced as she grew older. The most familiar portrait of her shows her in a religious habit (this image is from plantagenetdynasty.blogspot.com). Margaret was in her sixties in 1509 when her son, Henry VII, died. She was devastated & survived him by only a few weeks. She lived long enough to see her grandson, Henry VIII, crowned & had some influence in setting up his first Council. Margaret had achieved her greatest ambition. Elizabeth Norton’s book is well-researched & beautifully produced by Amberley Publishing. 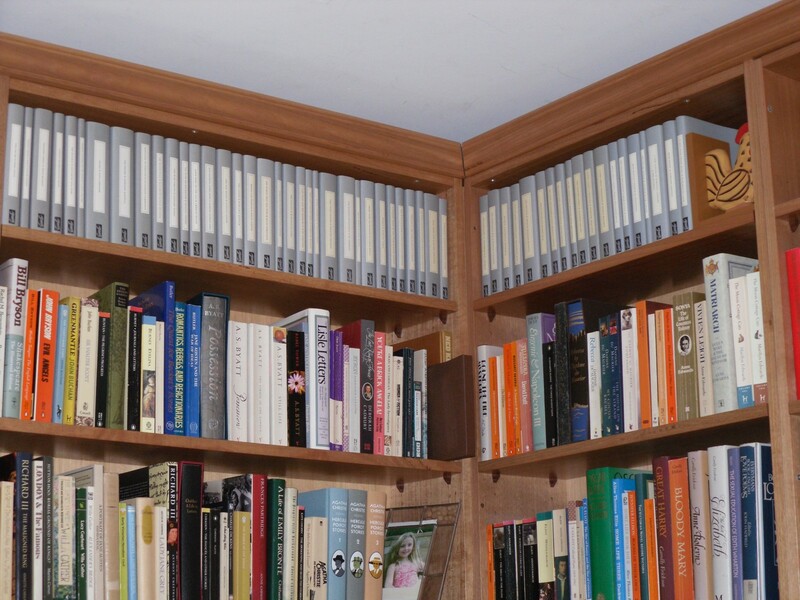 Amberley specialise in history & local studies & they publish many books on the Tudors. Elizabeth Norton has written books on four of Henry VIII’s Queens & is currently writing about one of Henry’s mistresses, Bessie Blount. I enjoyed reading about Margaret Beaufort. She was a strong woman who negotiated the political whirlpool of the 15th century with great skill & intelligence. Unusually she realised her ambitions & died peacefully, knowing that she had achieved her goals. Vera Brittain is one of my favourite authors. I don’t know whether I would call her most famous book, Testament of Youth, comfort reading, but I’ve read it many times over the last 30 years & I’m always moved by it. Vera Brittain was one of the most famous feminists & pacifists of the 20th century. Growing up in “provincial young-ladyhood” in the spa town of Buxton, Vera longed for more than a constant round of tennis parties & visits with marriage to a businessman like her father at the end of it. She fought her parents to be allowed to go to Oxford like her brother Edward. She was successful but her time at Oxford was interrupted by the outbreak of WWI. Edward & his two best friends, Roland Leighton & Victor Richardson, joined up. Vera soon found herself frustrated by Oxford when she longed to do something to help the war effort. Her feelings were intensified by her growing love for Roland & she enlisted as a VAD, training in hospitals in London before serving overseas in Malta & France. The next morning I had just finished dressing, and was putting the final touches to the pastel-blue crepe –de-Chine blouse, when the expected message came to say I was wanted on the telephone. Believing that I was at last to hear the voice for which I had waited for twenty-four hours, I dashed joyously into the corridor. 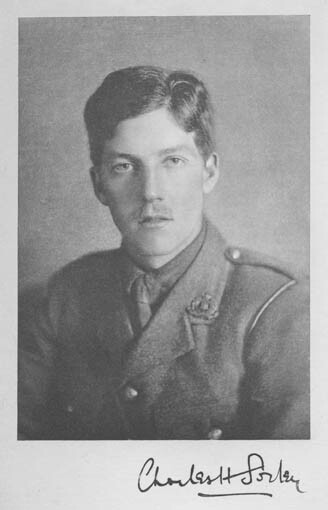 But the message was not from Roland but from Clare (Roland’s sister); it was not to say that he had arrived home that morning, but to tell me that he had died of wounds at a Casualty Clearing Station on December 23rd. When Vera was serving in Malta, she received word that Victor had been seriously wounded & she returned home to care for him. She planned to marry him in a spirit of self-sacrifice but fortunately, as she admits in Testament of Youth, she wasn’t called on to make that sacrifice, because Victor died soon after. 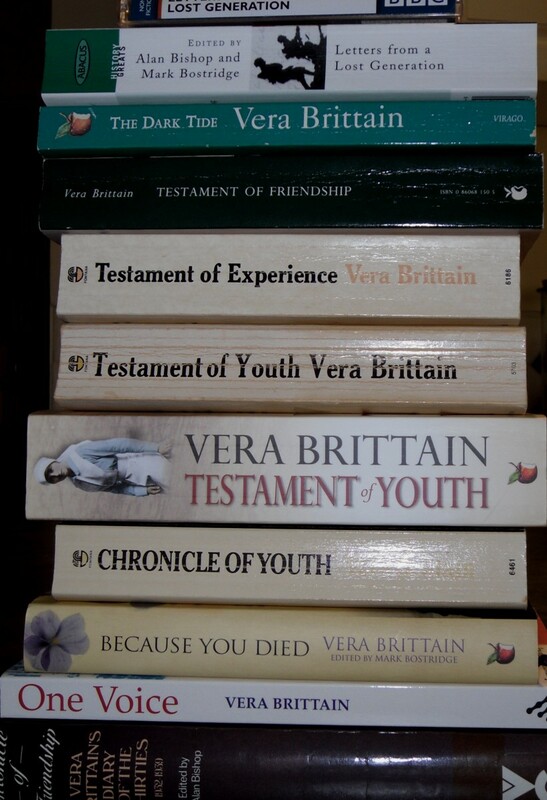 Vera’s honesty is what makes Testament of Youth such a remarkable book. She is able to look back & realise that her feelings for Victor were a reaction to Roland’s death & a feeling that her life was over so she may as well help someone else as she would never be happy again. She rejoined the nursing service & served in France, hoping to be near Edward. However, he was sent to Italy where he was killed on the Asiago Plateau in 1918. Vera wrote this poem to commemorate Edward’s wounding at the Somme (for which he was awarded the Military Cross) & sent it to him, inscribed in an anthology of poetry. It’s doubtful that he ever saw the poem as he was killed soon after. Although persistent dreams recurred of Roland and Edward - the one missing and purposely hiding his identity because facially mutilated, the other suffering some odd psychological complex which made him turn against us all and keep silence – I endured none of those nightmare recapitulations of hospital sounds of which other wartime nurses complained... Only the horrible delusion... that my face was changing, persisted until it became a permanent, fixed obsession. The delusion that she was growing a beard or turning into a witch persisted for some time. It was only the friendship of another student, Winifred Holtby, which saved Vera’s sanity & brought her some happiness. Their friendship is immortalised in Testament of Friendship, Vera’s biography of Winifred. Vera & Winifred moved to London after Oxford, determined to earn their living as writers. They both worked on novels & journalism & were active members of the League of Nations. Vera received a letter from George Catlin, a student at Oxford who admired her first novel, The Dark Tide. Their friendship grew through correspondence & they married in 1925. Roland wrote a beautiful poem to Vera while he was in France, foreseeing just such a situation if he should be killed. 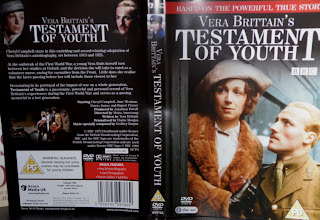 Testament of Youth was an immediate success when it was published in 1933. The late 1920s & 1930s saw many war memoirs published. Enough time had passed & readers were interested in reading about the War again. Vera’s book is so moving because it is a such an honest account of a woman’s experience of war. Her losses are so terrible – if it was fiction, it would be unbelievable - & yet, she survived. 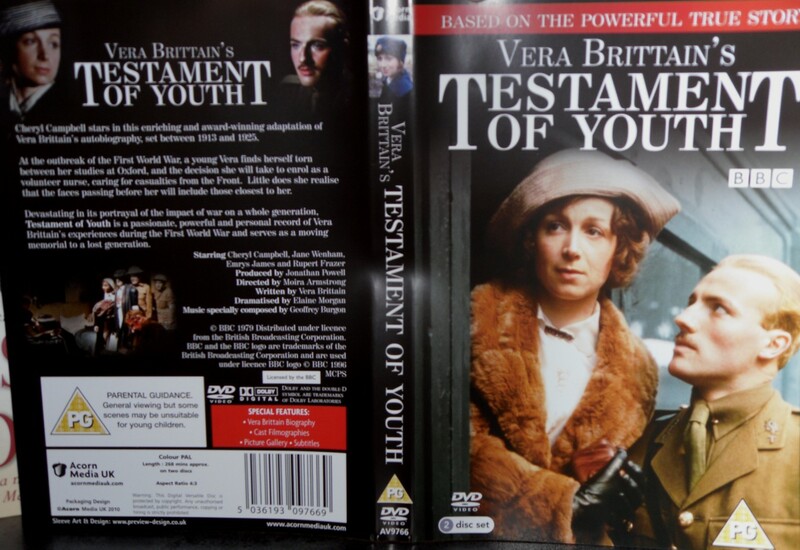 Testament of Youth was reprinted by Virago in the 1970s when the feminist movement led to a resurgent interest in women’s history. It was made into an excellent TV series with Cheryl Campbell, Rupert Frazer & Peter Woodward as Vera, Edward & Roland. 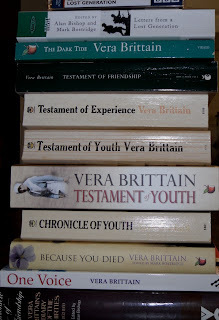 Vera’s letters, diaries & journalism were reprinted. Her diaries of the 1930s & WWII are fascinating & give an insight into London literary life as well as the Home Front during WWII. 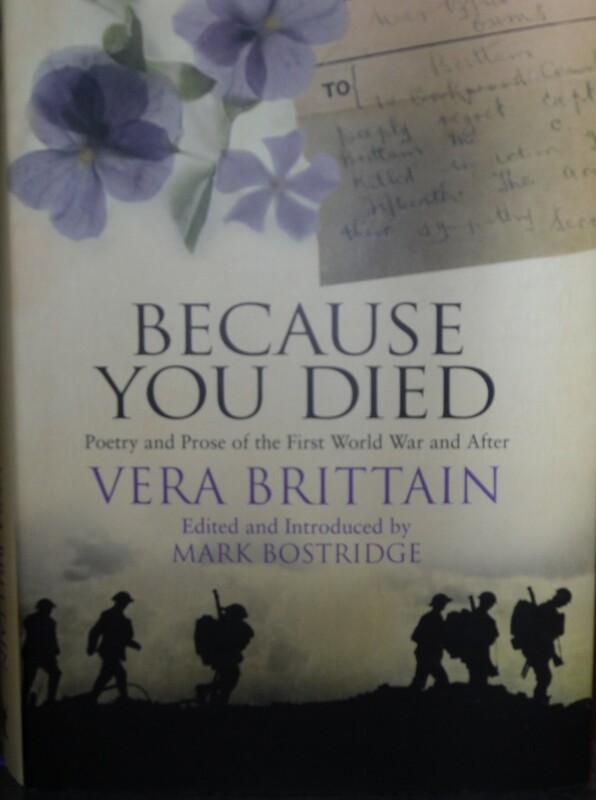 Vera Brittain was a passionate pacifist & her stance led her into some controversy during WWII. Letters from a Lost Generation is a collection of letters between Vera, Edward, Roland, Victor & Geoffrey Thurlow, another friend killed in action. A couple of years ago, Virago published Because You Died, a collection of Vera’s poetry & prose about the War, in a lovely hardback edition. 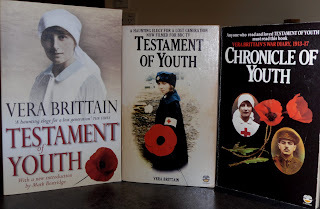 Reading Testament of Youth all those years ago has led me to all these books & more – about Vera Brittain, women’s experiences at war & afterwards, the war poets, other memoirs. I find the experiences of the young men & women who were caught up in WWI intensely moving & I marvel at their courage. I’ve been reading Marcia Muller’s Sharon McCone novels for almost 30 years. Sharon McCone was the first of the female PIs in the tradition of Sam Spade & Philip Marlowe. Marcia Muller’s early books were published by The Women’s Press, a great feminist publishing house that had a fantastic crime list. There have been many other female PIs since, especially in the 1980s. Sue Grafton’s Kinsey Millhone & Sara Paretsky’s V I Warshawski are still going strong but most of the others have long since disappeared, replaced by forensic pathologists like Kay Scarpetta & Tempe Brennan. Sharon McCone is a private investigator in San Francisco. Back in the 70s she was working at the All Soul’s Legal Co Op, steeped in the social justice ethics of the 1960s. I loved the All Soul’s days. But, times changed & the Co Op was taken over by lawyers who wanted to make a profit, the atmosphere changed & McCone struck out on her own, eventually starting up her own company, McCone Investigations. The business has grown, the technology has kept pace with the cutting edge, the new employees have become familiar. It’s interesting to read both Muller & Grafton’s series. The Kinsey Millhone novels are still set in the 1980s, they’re almost historical novels now. Kinsey uses pay phones & index cards rather than mobiles & computers. She trots along to Government agencies trying to get information using her contacts & smart talking instead of tapping into a database. I love the fact that Kinsey has stayed in the 80s, it’s part of the charm of the series. But, I don’t regret that Sharon McCone has moved with the times. Keeping a long series fresh for the author as well as the reader must be a constant challenge. In the last book in the series, Locked In, Sharon had been shot in the head by an intruder & was seriously wounded. She had locked-in syndrome & spent the whole book only able to communicate by blinking. Surprisingly, this worked really well. I was amazed at the clever way Muller took us inside Sharon’s mind while also moving the investigation along through shifting the point of view around between Sharon’s husband, Hy Ripinsky, her operatives, Craig Morland, Adah Joslyn, Mick Savage (also Sharon’s nephew) & Patrick Neilan. By the end of the book, Sharon had emerged from locked-in syndrome but still had a long way to go physically & mentally before she would be back to her old self. In the sequel, Coming Back, Sharon is still at the beginning of that long journey. After several months of rehab, she’s still struggling with the repercussions of the trauma she’s suffered. Fiercely independent, she is reluctant to ask for help, which infuriates Hy & her family. She stubbornly uses inefficient public transport inside of asking for lifts as she can’t drive. She works at her rehab as hard as she works at anything else in her life & is frustrated by her lack of progress. Her employees are frustrated by her moods & her refusal to let them help her. Some of them are also concerned that the old Sharon will never come back. Is the new Sharon fit enough for the job, physically & mentally? When Piper Quinn, a young woman she met at rehab goes missing, Sharon’s instincts sense trouble. Piper had been the victim of a hit & run driver, just getting back to work with a new apartment. When she doesn’t turn up at rehab, Sharon visits her home, only to find Piper semi-conscious on the couch & a strange woman who claims to be her aunt, hustling Sharon out the door as fast as possible. Sharon goes back the next day to find the apartment empty, stripped of everything, freshly painted & Piper is gone. Sharon gets the investigation moving but when Adah Joslyn goes back to check the apartment again, she is attacked & then kidnapped, presumably by the same people who made Piper disappear. The investigation uncovers the fact that Piper had been married to an marine stationed in Iraq. She had filed for divorce & then he was killed in a roadside bombing. However, the way she was kidnapped & the apartment cleaned up suggests a covert intelligence operation by rogue agents who can’t let go of the more unsavoury aspects of intelligence gathering in Iraq & Afghanistan under the previous Administration. What could Piper know or have that these people would go to such lengths to get hold of? The narrative moves from Sharon’s first person account to the third person viewpoints of Hy, Adah, Craig & the rest of the team. I could barely read quickly enough to keep up with the pace of the narrative. I read it in two sittings, like I do all Marcia Muller’s books. The tension is unbearable. Marcia Muller keeps the suspense of the investigation at a high level while also revealing more of the characters' private lives. I think that’s important in a series. Sharon & Hy’s marriage is under strain from the repercussions of her condition & her refusal to accept help. She values her independence & is frightened to think she may never get back to her old self. She’s constantly pushing at her limits, resenting the things she can no longer do. She has to work out how to repair her relationship with Hy & get her old life back – or how to cope if she can’t. That's just as interesting to a long-time fan like me as the investigation. Coming Back is the 27th book in the series. I can’t wait to read no 28. The marvellous thing was coming into this haven of calm water and, for a season, not having to worry my head with anything but uncovering their wall-painting for them. And, afterwards, perhaps I could make a new start, forget what the War and the rows with Vinny had done to me and begin where I’d left off. This is what I need, I thought – a new start and, afterwards, maybe I won’t be a casualty anymore. 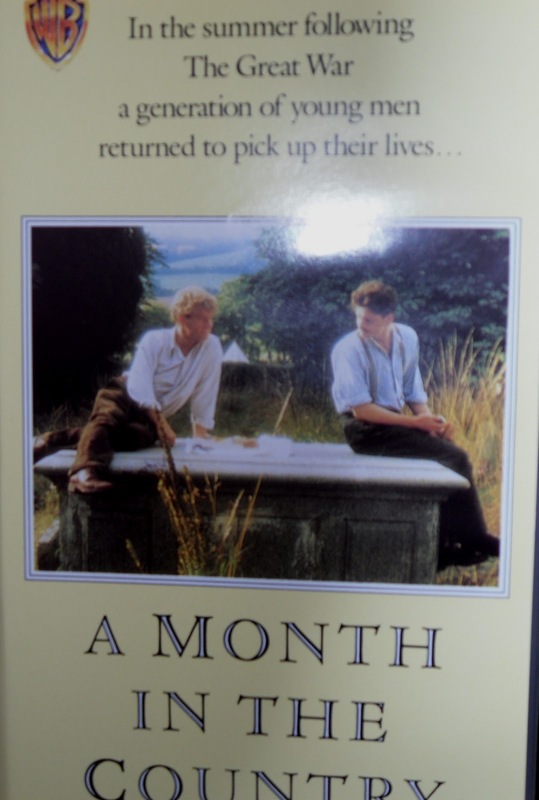 A Month in the Country is a perfect gem of a novel. It’s the story of Tom Birkin, a young man, a shell-shocked survivor of WWI & the weeks he spends in a Yorkshire village that begin to heal him. Tom arrives in Oxgodby to reveal a medieval wall-painting in the church. Miss Hebron, a local landowner, had left money in her will to the church’s restoration fund but only on the proviso that they employ someone to uncover the painting. The vicar, Rev Keach, is not happy about the intrusion or the fact that he wasn’t consulted by Miss Hebron. He’s an outsider, a Southerner in the North, a Churchman in a village of Chapel-goers. He’s unhappy about Tom’s work & unhappy that Tom wants to live in the bell-chamber. Tom is broke & can’t afford to stay anywhere else. He’s worked out his expenses very carefully, living frugally from one instalment of his pay to the next & he stubbornly insists on his right to stay in the church. Tom begins to heal almost from the moment he arrives. Afflicted with a stammer & a facial twitch, deserted by his wife, Vinny, trying to make a living in the very specialized field of restoration work, he’s nevertheless excited by the possibilities of the job at hand. He quickly realises that the wall-painting, a representation of the Judgment Day, with Christ in majesty at the top & the saved & the damned on either side, is of exceptional quality. As he slowly removes the whitewash that has hidden the painting since the Reformation, he comes to know the master artist who painted it. He even finds the hairs from his beard where he’s leant into the paint while it was still tacky. Artists often put recognisable portraits of locals in these paintings & Tom is sure that one soul falling head first into the fires of Hell, is a portrait of someone the artist knew. This man, with a crescent on his forehead, is so life-like, but who was he? Tom also meets the locals. Kathy Ellerbeck, daughter of the stationmaster, takes Tom in hand. She brings her father’s gramophone so he can listen to music while he works & food from her mother, who has soon discovered Tom’s poverty. Kathy & her family draw him into the life of the village. He has Sunday dinner with them, goes on the Sunday School treat, is taken along on a trip to Ripon to buy a new (secondhand) organ for the Chapel. On one memorable occasion, Tom is sent to deputize as preacher for Mr Ellerbeck at a nearby Chapel. He chooses the longest hymns he can think of but, in the end, tells the tiny congregation of his work on the painting, what it meant to the people who saw it in church every Sunday & how he is revealing its beauty again after so many centuries. She would discreetly leave the door slightly ajar and the seat herself in the back pew and then shelter behind her wide-brimmed straw hat (a rose pushed into its band). But for the occasional creak in the scaffold whenever I shuffled back a pace to see what I’d been doing, the building was so still that, although I was a good thirty paces away and my back towards her, we talked casually as we might have talked in a parlour. Not a conventional conversation – no more than a remark, a question, answer, exclamation. Really, there was no need to look: from the way she put things I could see her face. Tom speculates about the lovely Alice & the awkward, unprepossessing Rev Keach. He goes to the Vicarage to ask for his pay & wonders how they live together in the large house, surrounded by trees, but almost bare of furniture. By the end of the summer, with the painting uncovered & the weather turning to autumn, the idyll must end. Tom’s love for Alice is acknowledged but remains unexpressed, Moon discovers Piers Hebron’s tomb, which contains a surprise, & Tom realises that he must move on. A letter from his wife, asking for a reconciliation, calls him back to his old life. The healing that has begun in Oxgodby will continue as the memories of the War recede & the confidence Tom has gained set him up for the next stage of his life. This is one of my favourite books. Although not strictly about WWI, the melancholy sadness of the War is everywhere. The experiences of Birkin & Moon, the photographs in living rooms of sons who didn’t return, the atmosphere of renewal in the rural landscape. It’s heightened by the story being told by Tom in old age, looking back at that golden summer when he began to live again. It’s nostalgic without sentimentality. There’s a lot of humour & irony in the story as well as the fascinating details of how the wall-painting would have been created. 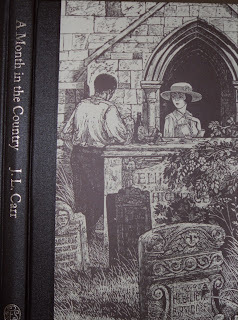 I have two copies of A Month in the Country – an old Penguin & a new, beautiful Folio Society edition with lovely illustrations by Ian Stephens, as you can see above. There’s also a movie that was made in the 80s with Colin Firth as Tom, Kenneth Branagh as Charles Moon, Natasha Richardson as Alice & Patrick Malahide as Rev Keach. I recommend this, it’s a beautiful recreation of the book. 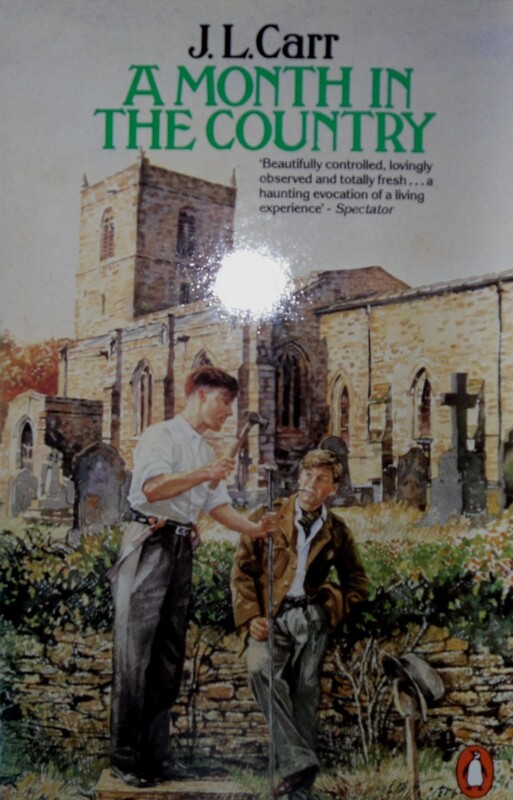 I like to read A Month in the Country in November, along with the poetry of Owen, Sassoon & Edward Thomas. Although the novel was published in 1980 (it was shortlisted for the Booker Prize), it evokes all the feelings of melancholy & the need for healing that so many must have felt after the War. Reading A Month in the Country is a moving experience. In November, my thoughts turn to Remembrance Day & I often decide to read about WWI & WWII. 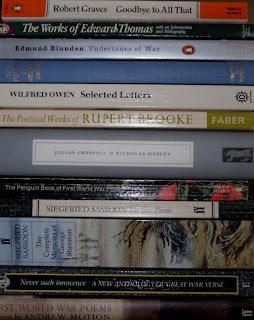 This year, I’ve begun with the poets of WWI. I first read Wilfred Owen, Siegfried Sassoon & Rupert Brooke as a teenager & I’m still moved by their work & their lives. 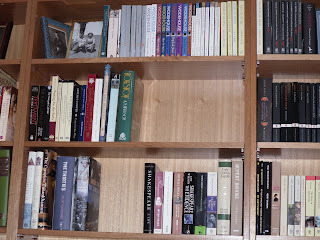 Since then, I’ve read many anthologies, biographies & critical books about the period & the writers. 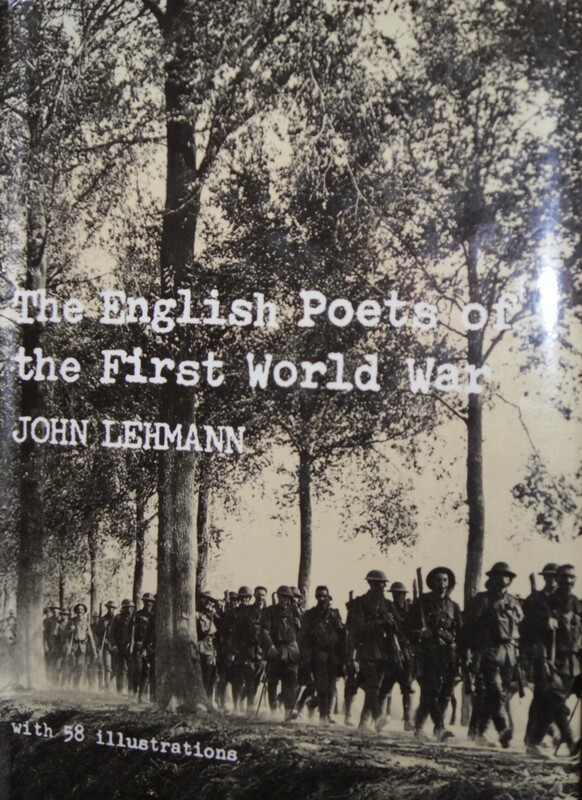 John Lehmann’s book, English Poets of the First World War, was published in 1981. I rescued this copy from a library book sale & I’ve been reading it over the last couple of days as well as dipping into some of the other books you can see in the photo below. Lehmann concentrates on 15 major poets & looks at the work they wrote during the war, rather than the poetry & prose they wrote long afterwards, if, indeed, they survived. The poetry of the war fell into two distinct phases. From the beginning of the war in 1914 until the Battle of the Somme in 1916, it was still possible for patriotic young men to write poetry glorifying war & revelling in the opportunity to be a part of this great adventure. 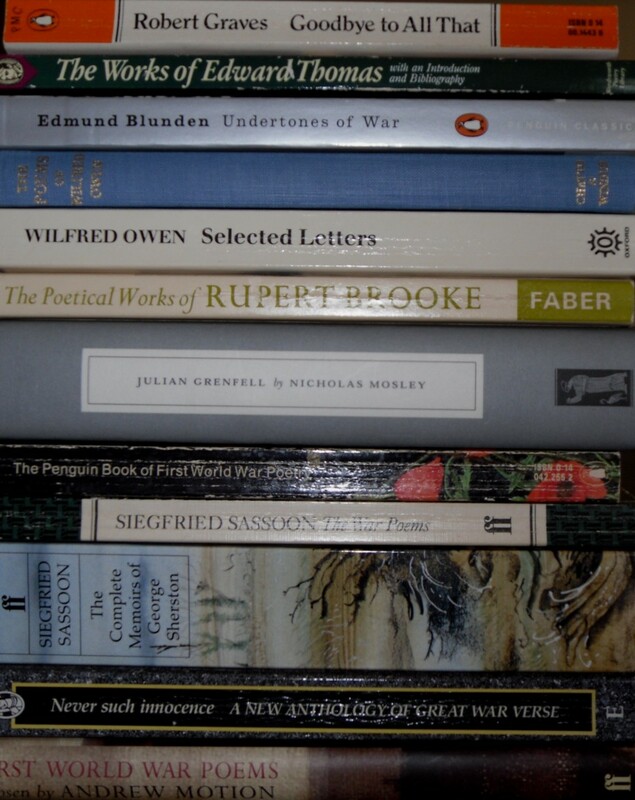 Rupert Brooke’s 1914 Sonnets & Julian Grenfell’s Into Battle are the most famous examples. Brooke & Grenfell both died in 1915 so there’s no way of knowing how their work would have changed as the optimism of the first part of the war was replaced by the despair of trench warfare that seemed neverending. Another poet who was killed in 1915 at the age of 20 was Charles Hamilton Sorley (the photo above is from the suffolkregiment.org website). I’ve always loved this poem. 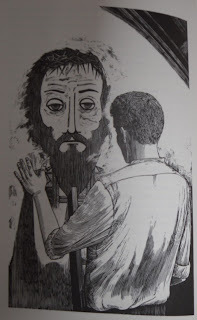 The image of the dead being oblivious to our pity & grief is intensely moving & comforting as well. Their pain is past. Sassoon & Owen are the most famous of the war poets. Their meeting at the hospital at Craiglockhart has been written about many times, both as fact & fiction. That meeting led to Owen’s miraculous last year when he wrote the poems that made his name after his death just a week before the Armistice. Sassoon survived the war & continued writing poetry but his War Poems remained his most famous & best-loved work. He also wrote three volumes of fictionalised autobiography, collected by Faber as The Complete Memoirs of George Sherston. His poem, Does It Matter?, exemplifies the bitter, almost brutal poetry of the last years of the war. The feeling of hopelessness & pity of the speaker contrasts with the bitter undertone accusing those safe at home of not valuing the sacrifice made by the men at the Front. Wilfred Owen could also write with bitterness of the horrors of war but I find the quiet, elegiac tone of Anthem for Doomed Youth so moving. The final image of the families left at home for long years without the men who will never come home, quietly grieving in that long period of mourning after the war is filled with melancholy. - Only the monstrous anger of the guns. 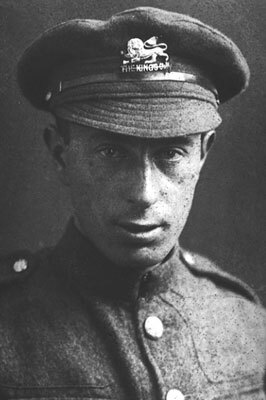 Isaac Rosenberg was killed in April 1918 (The photo below is from iwm.org.uk). His poem, Break of Day in the Trenches, is a meditation in a moment of peace before the madness of battle. It reminds me of John Donne & the metaphysical poets in the humour in which he sticks a poppy behind his ear & addresses a rat that has strayed into his trench from No Man’s Land. It is the same old druid Time as ever. 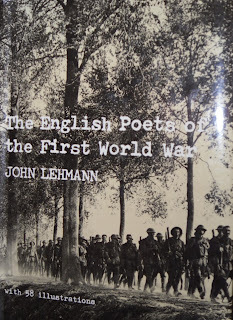 John Lehmann’s book is an excellent introduction to the WWI poets but it might be hard to get hold of. Jon Silkin’s Penguin Book of First World War Poetry (1979) has an extensive Introduction & there should be lots of second hand copies around. There’s an updated Penguin Book of First World War Poetry (2006) edited by Matthew George Walter which is in print but I haven’t seen it. Penguin Classics always have good notes & introductions so I’m sure this would be a good choice. I’ll continue my Remembrance reading throughout the month. It’s NYRB Reading Week & I haven’t chosen any of the NYRB titles sitting on the tbr shelves. I borrowed one from the library instead. I’m continuing my Mitford theme this year with Jessica Mitford’s Poison Penmanship : the gentle art of muckraking. 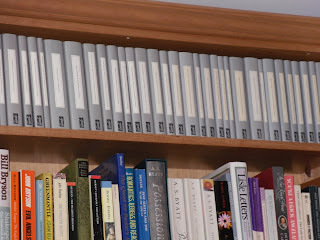 This is a collection of articles Mitford wrote for various American magazines. Most of the articles come under the heading of muckraking, “one who seeks out and publishes scandals and the like about prominent people”, as Mitford quotes in her Introduction from the OED. Mitford was first called Queen of the Muckrakers by Time magazine after her article on the Famous Writers School was published. This is one of the most interesting articles in the book. The Famous Writers School was a company that put big, full-page ads in magazines & newspapers to sell their correspondence courses on how to be a freelance writer. They exaggerated the ease of becoming a freelance & how much money one could earn. Their door-to-door salesmen used hard sell tactics & they engaged well-known writers to lend their names to the ads. It turned out that these writers had very little to do with the company, apart from accepting large fees for the use of their name & photo. They didn’t teach the courses, read the submissions & hadn’t even read the course material. The courses were expensive & most of the students never completed the assignments. They were dissatisfied with the lack of direction & personal contact. Not surprising when each assignment would be corrected by a different person, using standard phrases & jargon from a script they followed. Mitford’s article was published in Atlantic Magazine, but only after it had been rejected by several other journals because they were afraid of losing the advertising revenue they made from the Famous Writers School. When the article was published, the reaction was immediate. Stock in the company plunged & their profits dropped dramatically. A wonderful example of the power of the Press to alert consumers to a scam & expose crooks. Even more interesting than the articles are the Comments Mitford adds at the end of each one. She sets the article in context & examines the impact the article had, what she would have done differently, & how she went about researching & structuring the piece. The most famous article in the collection is St Peter, Don’t You Call Me, which is about the funeral business. This led to the bestselling book, The American Way of Death. The article examines the way funeral directors take advantage of grieving families to make a profit. There are many wonderful examples of the euphemistic language used to describe coffins, shrouds, embalming techniques. It’s funny & gruesome at the same time. It’s also shocking to realise how often funeral directors would discreetly find out how much families could afford to pay & tailor the costs so they would exactly match the amount of the insurance payout or funeral plan fund. Mitford’s article led to a backlash against unnecessarily expensive funerals & the growth of co-operative societies that provided a service while keeping costs down. In the Introduction, Mitford explains how to research such articles. The importance of getting hold of trade journals for background information (this was crucial in the funeral article), compiling a list of questions ranging from Kind to Cruel when interviewing potentially hostile subjects, how to structure the article & avoid libel actions. Poison Penmanship could still be used as a textbook for journalism students today, although, as it was originally published in the 1970s, they would have to take account of the internet as a research tool. I read Jessica Mitford’s Letters earlier this year & it was fascinating to read the articles she wrote about in her letters. It enriched the experience of reading this book so much. I’d recommend the letters to anyone who loves reading other people’s letters but they also gave a lot of insight into the process of researching & writing these articles as she often wrote to family & friends while she was working on them. Poison Penmanship is an insight into radical journalism in the 60s & 70s when it was perhaps easier to enrage & shock the public about injustice & dishonesty than it is today. You can find all the details of NYRB Reading Week on The Literary Stew & Coffeespoons blogs, where you’ll also find links to lots of other reviews of NYRB titles. It's not too late to join in if you have NYRB books on the tbr shelves, and there are prizes to be won for posting a review. Thank you to Mrs B & Honey for hosting the Reading Week.